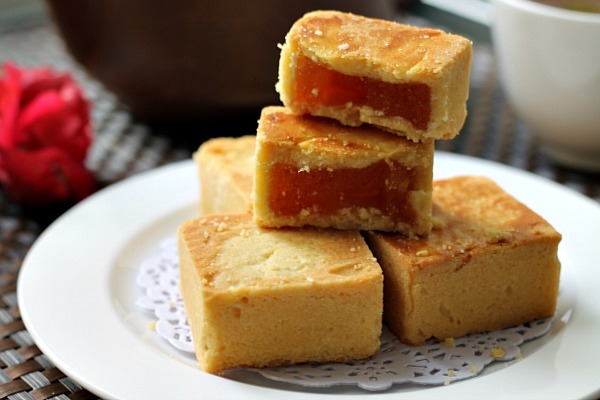 my bare cupboard: Taiwanese pineapple shortcakes ( pastry ) "
So , how do you like my pineapple shortcakes ? Pretty shapes , don't you think ? 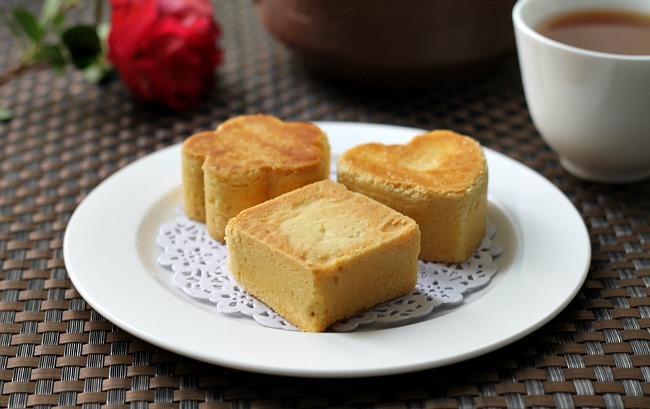 The Taiwanese pineapple cake version don't use egg wash . I want to see how it would turn out so I uses some and planned to brush half of the top only but got carried away :P The bottom part though patchy is what I like most . It's homemade , cheap , simple , really easy and fast to make ( the dough not the filling ) and most of all tastes fantastic ! 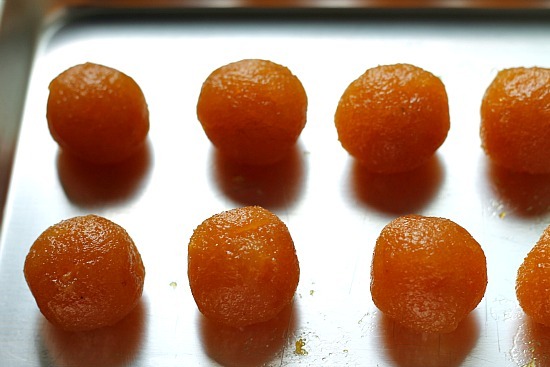 * Divide pineapple filling into eight portions ans shape into balls ; set aside . * Sift the cake flour , icing sugar , milk powder and custard powder into a medium bowl . * Add butter into the flour mixture and rub with fingertips until mixture resembles bread crumbs , tip it in into a clean surface and knead to form a soft dough . Divide into 8 pieces . 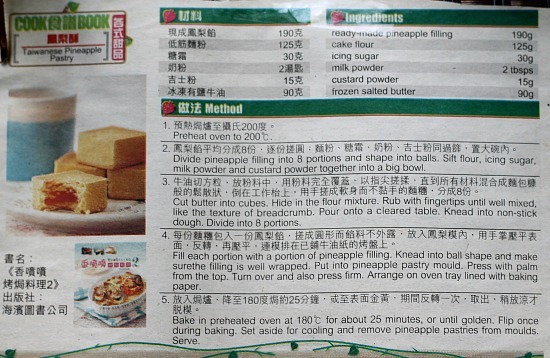 * Fill each dough with the pineapple filling , shape into a ball , make sure that the filling is well-wrapped . Put into a pineapple pastry mould ; press with palm from top , turn it over and press the other side . Put on the baking sheet with parchment paper . * Bake in a preheated over at 180°C ( don't know if temperature needs turning down ) for about 25 minutes or until golden brown . Flip once during baking . Set in a wire rack to cool before unmolding . * Pureé pineapple slices in the food processor until smooth . Pour into a wok or a large pan and cook over medium low heat , stirring from time to time , the mixture will splatter so better watch yourself . Add sugar when mixture is a little bit dry and continue to cook for about an hour or until thick . Transfer to a heatproof container to cool before using . 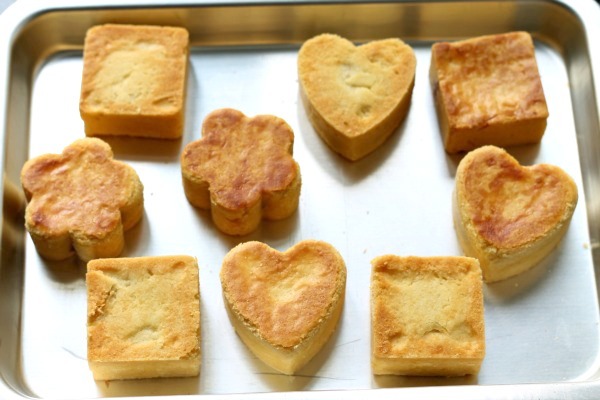 I've used cookie moulds in this recipe , the square one measures 4 by 2 cm and both flower and heart shape , a bit smaller . The weight of dough is 295 grams , I divided it into 10 portion ; the filling , some are 20 grams and some are about 18 grams . Wow Anne! I really have to congratulate you! You are right to say that your pineapple shortcakes look exactly like those sold in the shop! You can start selling them now! they also have that here, tiyay but open faced. pineapple tarts lang. i've been wanting to buy from the grocery but uber mahal! it's like 8sgd. over! Hi Ann, very nicely done Taiwanese pineapple tarts. I actually enjoy these more than the normal ones... not sure why, perhaps its the shape! Btw, Little Thumbs Up starts on every first Tuesday of every month and ends after two weeks. If you wish to link this post to the event, I'm happy to open up the link now and fix this problem for you. Cheers! I have added your link! these are very intriguing! and they look so pretty...do you think i could cheat and use jam for the filling, or would that be too liquid-y? I have never tried them, they look really perfect! So glad I found your blog over on google+. These shortcakes look delicious. I have now subscribed so that I don't miss your next delicious recipe. Anne, I would love to try this. I am sure this is a new experience from the traditional pineapple tarts. Looks great. i'm chuckling when i read that you say ' easy to make' ( not the filling) LOL!! i've tasted once the taiwanese pineapple tarts many many years ago and frankly, cant remember how exactly it was like. but i can say that your pineapple tarts are cute and they look good! Anne, you are right, these indeed look like those sold in the shops. I've eaten some made by a visiting Taiwanese chef before and these look just as fabulous! these sound delicious. the cake part looks like a perfect dough. would love to try them! These are the cutest things I have seen today! Well done my friend. 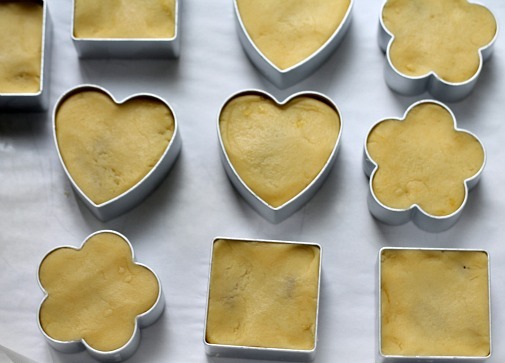 I have never baked anything pineapple-y, but this is making me want to!! They really look beautiful. I like the idea of stuffing it with homemade pineapple filling. I never try making Taiwanese pineapple tarts before. Must bookmark this :) these really looks like the ones sell in stores. Lovely shapes too. Have a lovely week ahead ! Anne, these look really good and tempting! I came across this post as I was searching for pineapple shortcake recipes. I'm going to try them! Wish me luck!